How Do You Collect Sytems Level Functional Neural Data? An incredibly important step, maybe even the most important step, in neuroengineering pipelines is collecting neural signals from the brain. The logic is that if you can collect higher resolution signals both spatially and temporally you can better understand a system of neurons which improves all three areas of neuroengineering. Let's first understand the types of neural signals we can collect from the brain. At a systems level, neuroscience data can be divided into functional neural data and structural neural data. If you are familiar with the canonical biological saying “structure leads to function,” this division shouldn't surprise you. If you are not familiar, no worries! Many examples of structure leading to function are attached to your body. Teeth are a common example: you have sharp incisors well as flatter molars. The structure, or the shape, of your tooth leads to its function. Therefore, the sharp incisors are meant for tearing while the flatter molars are meant for grinding. To give a neuroscience example, the structure of the myelin sheath directly alters the function of the neuron. 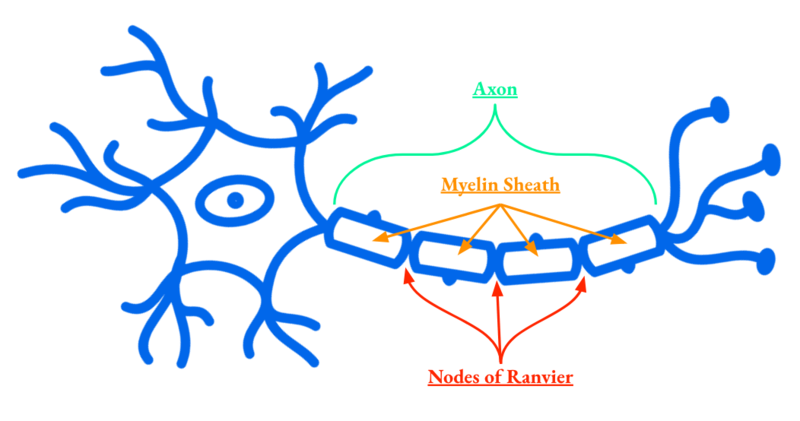 The myelin sheath allows action potentials to quickly propagate down the axon by jumping from one Node of Ranvier to the next, greatly increasing an action potential's speed of electrical transmission. Now that we have a joint understanding of structure leading to function. What is the difference between functional and structural neural data? Functional neural data encapsulates the activity encoded within a neuron or neural system. On the other hand, structural neural data consists of the organization, shape, or chemical makeup of a neuron or neural system. Although both functional and structural neural data are important for neuroengineering, we are going to use this blog post to focus on how you can collect systems level, functional neural signals from the brain. There are a variety of categories namely: invasive & optical, invasive & electrical, and noninvasive. And, within these categories there are many methods to collect signals. Some of these methods are exclusively used in animals, while other methods are used in both humans and animals. In our master diagram below if a method is used in vivo solely with animals it will be tagged with a mouse icon, and if it is used in both humans and animals in vivo it will be tagged with a human icon. In vivo means that the technique occurs in a living animal, and not in a cultured cell. Since not all the tools are used in humans, we will create our master diagram in a monkey brain. 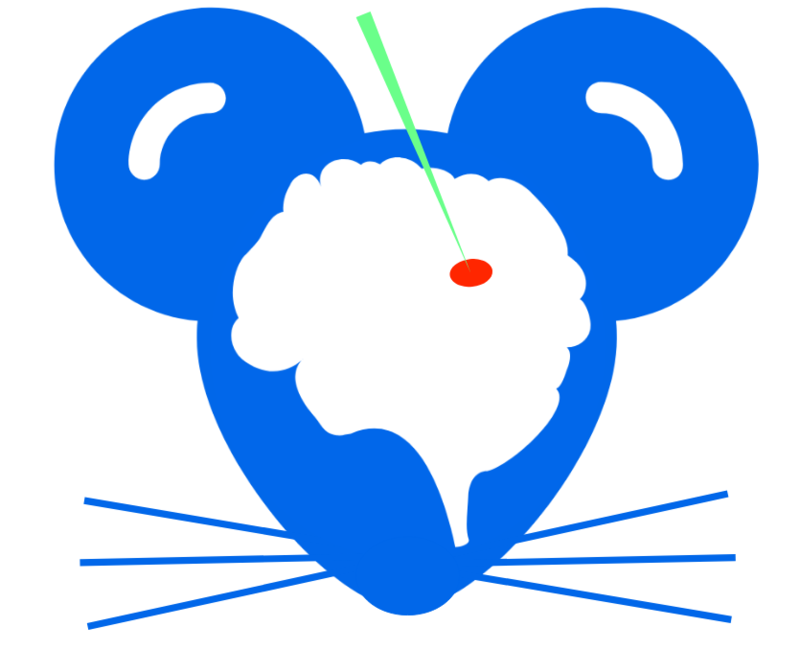 Note: even though we are using a mouse icon and a monkey brain for our diagram, these experiments can occur in many types of animals including C. elegans (worms), Drosophila melanogaster (flies), Rattus norvegicus (rats), etc. Fair warning this next image is a mouthful, but like always, we will walk through it together. That was admittedly a lot, but it was intentional. Hopefully you can now visualize the general location where each of these techniques operate. Let's break it down some more, before walking through the techniques. For systems level neuroengineering, what do we want out of a functional neural signal?... Pause for a second and think about what you would want. In the ideal world, we would want to know precisely which neuron fired, where that neuron fired, and when that neuron fired. Which neuron deals with the neuron's unique identity, where deals with a neuron's location in the neural system, and when deals with the latency between the true action potential and the measurement's reporting of the action potential. When investigating each method we will evaluate how it performs on our three metrics of: (1) which, (2) where, and (3) when. Before we dive in further, I have a neuroscience lab experiment that you can run on your own. It will help you internalize some of what we discuss in this blog post and is pretty awesome, but you have to make it to the bottom! Optical indicators are divided by what we use to measure neuronal firing (voltage or calcium), and how we measure neuronal firing (chemically or genetically). There are therefore four possible combinations to optically measure functional signals. Ok, sure. But why are these methods optical? In order to pick up a fluorescence signal from a neuron an indicator, whether chemical or genetic, must be in the presence of enough energy to change its conformation and a substrate, calcium or voltage (voltage isn't really a substrate, but for now pretend it is). The indicator needs energy so that it can change its shape and report back to us when it sees the calcium or voltage. So how do we get energy to the indicator? In this case, light happens to be a very convenient way to transfer energy. A higher energy wavelength of light is passed to the indicator within the neuron, and if the indicator is also in the presence of the substrate it cares about the indicator will change its conformation and emit a lower energy wavelength of light. This lower energy wavelength of light can be picked up by various optical sensors. This method of optically picking up action potentials is not only incredibly powerful, but also remarkably beautiful. If you don't believe me, check out the video below where a spark of light is literally correlated to a neuron's action potential. I'm not going to tell you whether the light is correlated to the voltage or calcium in this video just yet, so make a guess, and we will revisit soon! Now that we have a little background, let's jump in! When a neuron fires an action potential its membrane potential, or the electrical potential difference between the inside and outside of the neuron, rapidly increases. In future blog posts, we will dive into exactly how a neuron fires an action potential, but for now know that during an action potential (1) calcium, or Ca2+, ions flood the neuron's cell body and the tips of its axons, also known as presynaptic terminals, and (2) the voltage difference across the neuron's membrane changes. Hopefully now you can guess that: voltage indicators aim to directly measure and report membrane potential changes, while calcium indicators aim to measure and report calcium concentration changes. 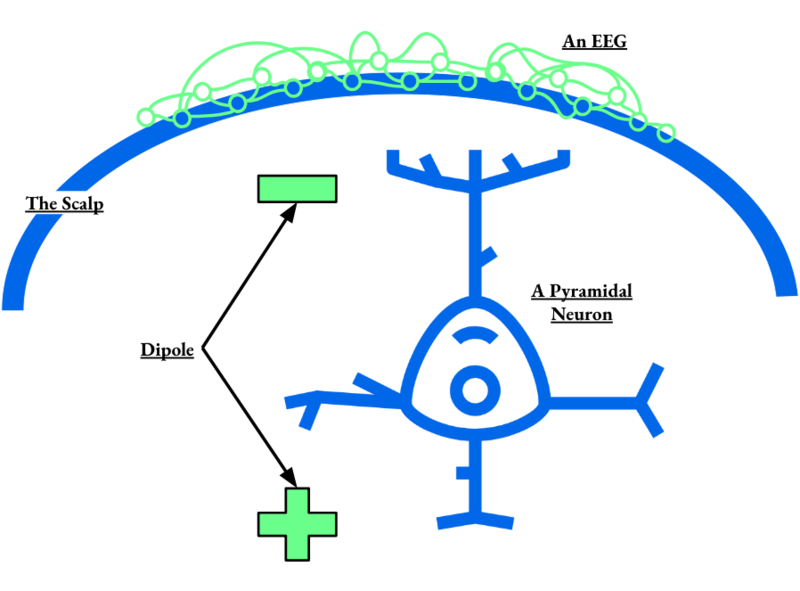 The methods differ in regard to when the neuron's action potential gets reported. However, both metrics can precisely identify which neuron fired and where in the neural system the neuron fired. Calcium indicators are responsible for reporting the intracellular calcium concentration, they therefore are localized to a neuron's cytoplasm. 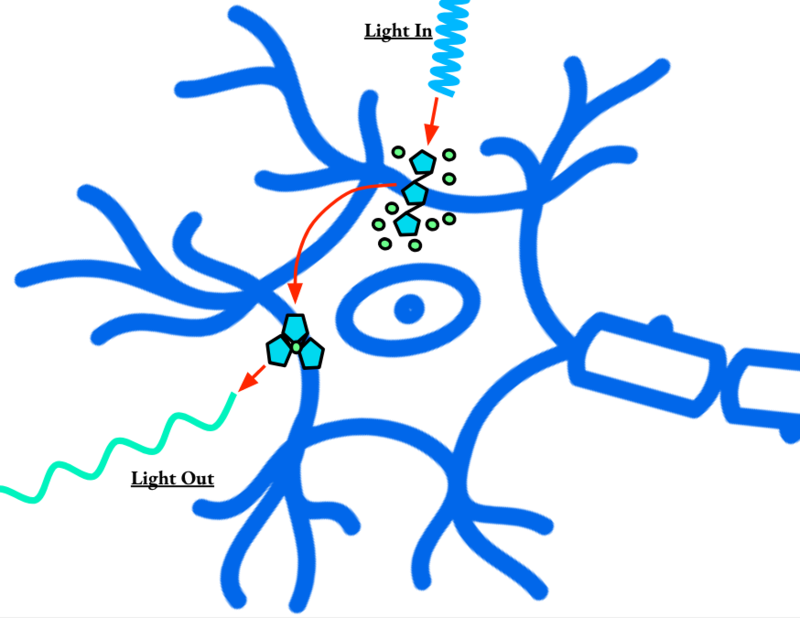 As discussed above, when calcium rushes into the cell and a specific wavelength of light is shining on the neuron, a fluorescence indicator, either chemical or genetic, changes its conformation and releases a different wavelength of light out. This wavelength that come out can then be measured. Let's zoom in on the neuron's cytoplasm to see how it works. That sounds great, so what's the catch? Well calcium concentration changes are very slow, compared to the speed of an action potential. An action potential can take a few milliseconds, while calcium concentration changes occur on the order of tens of milliseconds. This means that calcium indicators have a significant time lag between when a true action potential fires and when the signal can be picked up. In addition to reporting action potentials too slowly, there is another issue related to calcium's slow kinetics. Can you guess what it is? Since calcium is so slow, it's concentration changes do not always track the small voltage fluctuations from sub-threshold stimuli. 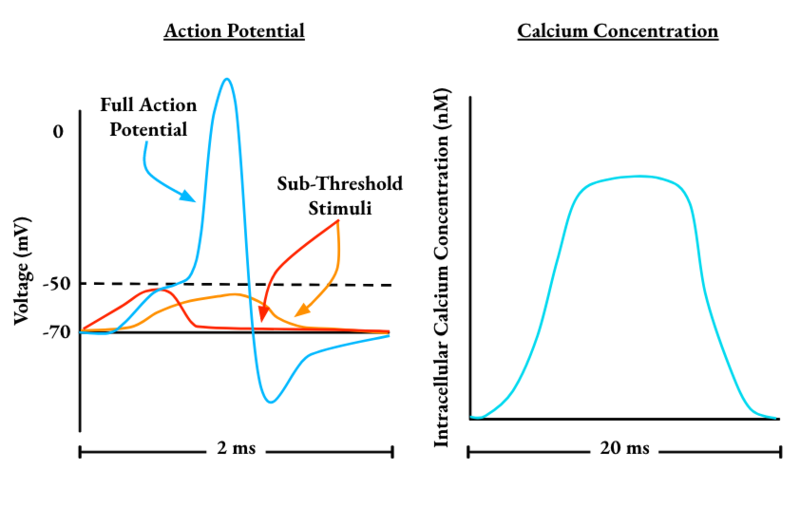 Even though these sub-threshold stimuli do not always result in action potentials, they are still lost information due to calcium's lack of sensitivity. Based on the image above as well as what we have discussed so far, you can see how knowing exactly when neurons fire is a bit of an issue for calcium indicators. However, calcium indicators are pretty good at knowing where neurons fire, and which neurons fire. Check out the video below of two types of calcium imaging. The video might not look incredibly clear, but there are many segmentation techniques that allow us to precisely pinpoint which neuron is firing, so that the where and which criteria are easily met. Let's pause and recognize that we have now seen two videos of neurons emitting light based on when they are active. That is insane and ridiculously powerful! Voltage indicators are mechanistically similar to calcium indicators, but differ in their localization and substrates. Since voltage indicators are responsible for reporting the voltage differences across the membrane, they are membrane bound unlike the cytosol bound calcium indicators. In addition, there are many substrates that voltage indicators can respond to including sodium, Na+, potassium, K+, or protons, H+. The image below details the mechanism of a voltage indicator. Take a moment to find all the differences between this image and the calcium indicator image above. It is also worth mentioning that the membrane is very flexible and is even referred to as a "sea of lipids," so the indicators can move around relatively freely and are not more stationary than the cytoplasmic calcium indicators. Despite the many differences between voltage and calcium indicators the high level fluorescent mechanism is very similar, so we won't walk through the pathway again. Instead, we will jump to the issues with voltage indicators. Since voltage is more directly linked to neural firing than calcium concentration, it is theoretically a better way to measure action potentials. In addition, voltage indicators should be able to pick up the sub-threshold stimuli that calcium indicators cannot. Unfortunately there's a big issue that we run into, voltage indicators have a low signal-to-noise ratio. Having a low signal-to-noise ratio means that it is difficult to pick out when the neuron is fluorescing because the background also contains some fluorescent signal. This is partially because voltage indicators are only present on the neuron's membrane, unlike the calcium indicators which are present in the cytosol. There is therefore less area to pack in the indicators that produce the fluorescence signal. Voltage indicators perform really well on the when metric, but struggle a little more on the which and where metric when compared to calcium indicators. However, there is a lot of up and coming research devoted to making voltage indicators more viable in vivo. Despite these difficulties the images generated are truly amazing. It is crazy that we have the capabilities to see an action potential. The video below is the first one we looked, and is a voltage indicator. Calcium indicators have slower kinetics than voltage indicators, however calcium indicators are much more mature than voltage indicators are. By mature I mean that they have been more developed and used in the field of neuroscience and neuroengineering. Voltage indicators, however, are being heavily developed. There are many more issues with both of types of indicators like phototoxicity or photostability. 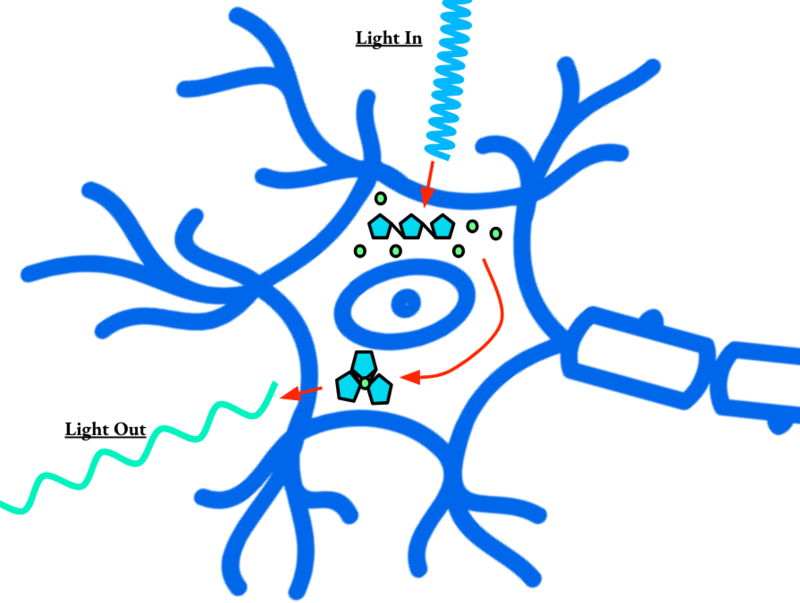 Phototoxicity is when neurons get damaged because they are being exposed to too much light. 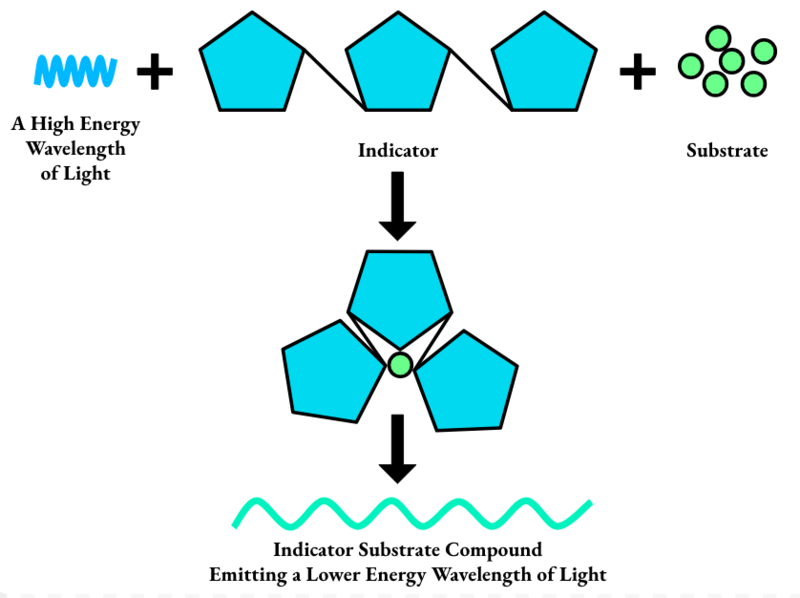 Photostability is when the indicator cannot hold its conformation under lots of light exposure. These are just a few of the issues we can run into. To recap: calcium indicators are currently more widely used than voltage indicators, voltage indicators have faster kinetics than calcium indicators, and calcium indicators are cytosol bound while voltage indicators are membrane bound. We have covered a lot of ground, but how the heck do these indicators get put in certain neural populations? I am so glad you asked! Chemical and genetic indicators both follow the general outline of high energy wavelength + indicator + substrate leads to a conformational change that releases a lower energy wavelength. In this blog post, we are not going to go into much more mechanistic depth, because it is more important to talk about the significance and localization of chemical verse genetic indicators. Chemical indicators are synthetic molecules that work given the pathway we defined above, and are introduced to neuronal populations via injection. Indicator injection is clearly not ideal because this leads to decreased sensitivity, increases signal variability depending on injection method, and makes it impossible to measure the output from the same neuron over the course of months. There are sophisticated tools to guide an injection but it's still not incredibly precise, and looks like something as follows. In conclusion, chemical indicators generally do a good job with the when metric, and even offer higher sensitivities than genetic indicators. However, they struggle with consistently identifying which neuron and where that neuron is located over the course of months. In walks the genetic indicator. Genetic indicators are very much the superstars on the block when it comes to optical imaging, because the indicator is encoded in DNA! 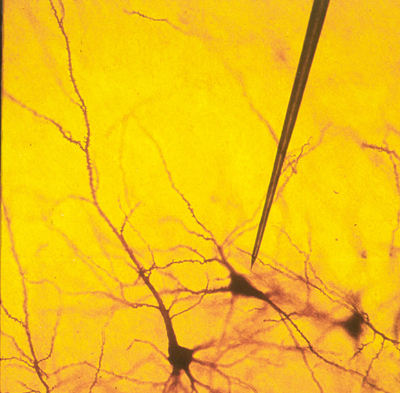 This means that the neuron itself has the capability to construct its own fluorescence indicator, injection free. As long as you can encode the indicator into the genes of specific neural populations, you get the precision you need. There are many expression systems to target neural populations depending on the animal model. In fruit flies, the Gal4-UAS system is popular, in mice Cre-Lox is widely used. Those expression systems are easily multiple blog posts on their own, so we won't dive in now. The specificity of this technique combined with the many methods allowing you to target neuronal subpopulations means that genetic indicators are a blessing for neuroscientists and neuroengineers alike. In fact, all the videos we have seen thus far are either genetically encoded calcium indicators, GECIs, or genetically encoded voltage indicators, GEVIs. Below is another GECI video! Genetic indicators hit all the when, which, and where metrics well. However, keep in mind that an indicator is only as strong as its weakest link. Therefore, if the indicator is a GECI all the problems with the broad class of calcium indicators apply to the GECI. Unfortunately, nothing is perfect. Now that we have a good understanding of what an optical indicator is, we can dive into some electrical recording mechanisms. Electrical recording arrays, also known as multielectrode arrays, can be 3D, 2D or non-invasive and all work in surprisingly similar manners. The technology revolves around local field potentials. Local field potentials are the summation of electrical activity from many neurons measured in relation to a distal ground. Whether or not you are familiar with electrical engineering, think of distal ground as the reference point for the brain's electrical circuit. So how does measuring brain activity from local field potentials work? When a neuron fires an action potential we know that the voltage across the membrane changes. Therefore, if we place an electrode, normally a metal tip, close enough to a neuron the electrode should be able to detect those voltage changes. We have previously discussed how one can detect individual neuronal traces from population neuronal recordings, so we won't dive into that. Instead, what are the various arrays that exist? When we say an array is 3D, what do we mean? We mean that the array has some depth and protrudes into the brain. Arrays that are 3D can either be 3D-3D arrays meaning that they have a depth that protrudes into the brain and their tips are not in the same plane, as well as 3D-2D arrays which have a depth that protrudes into the brain but their tips are in the same plane. In practice these arrays are just called 3D or 2D, but for this blog post go with the 3D-3D and 3D-2D characterizations. Let's look at some examples. The Utah slanted array as well as the Utah array are very popular arrays that can detect voltage changes at their tips. Can you guess why there is a need for both 3D-3D arrays as well as 3D-2D arrays? It is mostly because each array captures neuronal populations in different planes. 3D-3D arrays can capture signals in more brain regions, although fewer neurons in each population, while 3D-2D arrays can only target one depth of neuronal populations but can get more neurons in those populations. See the figure below for a visual representation of this property. You can see that the 3D-2D array is capturing just the dark blue and lime green populations, while the 3D-3D array is capturing all four of the brain regions of interest in the sample that we are looking at, but in different planes. Capturing signals in different planes is illustrated by the black dashed lines in the 3D-3D cross sectional view. Each horizontal row of dashed lines represents an electrode row indicated by the gray arrows. Each vertical column of dashed lines represents a column of the electrode array. The 3D arrays we have discussed, are only one type of 3D arrays. I would be remiss if we didn't discuss one of the hottest electrodes that we have actually learned about before, the neuropixel probe. The neuropixel probe is different from both Utah arrays because it is capable of recording all the way down its shank instead of just at the tip. 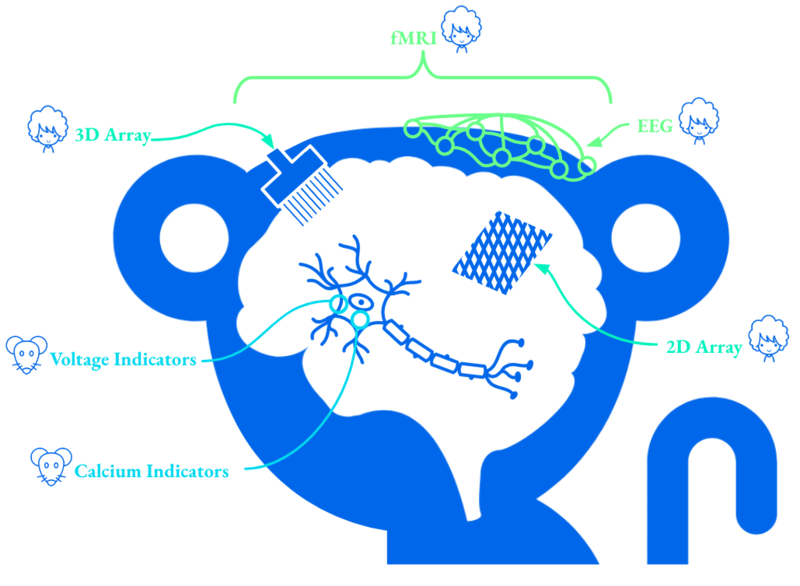 In addition, each row of the neuropixel has 4 recording sites. It is therefore able to collect neural activity across a plane (the advantage of the 3D-2D arrays), as well as across many depths (the advantage of the 3D-3D arrays). The neuropixel probe just got released to the neuroscience and neuroengineering communities at large on October 31st, 2018. In case you are counting, that is roughly two weeks ago. This technology is state of the art. 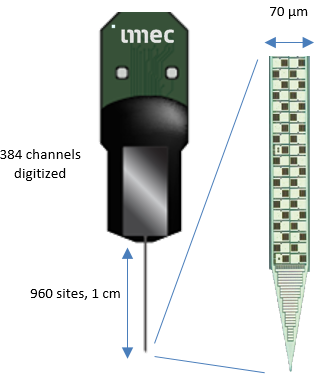 According to the president and chief scientist at the Allen Institute, Christof Koch, "in the race between optical and electric methods of recording large-scale cellular activity, imec’s Neuropixels just delivered the next great leap forward – reliably recording spikes from hundreds of neurons simultaneously with sub-millisecond resolution in a small, convenient and inexpensive package”. This is a huge deal! These arrays sound amazing but what about our criteria of when, which, and where? As we have already learned, voltage is an amazing proxy for telling when a neuron fires an action potential. Since electrode arrays measure voltage, they have the when down pat. However, arrays are fairly hard objects inserted into the brain, therefore the arrays and brain move in relation to one another. The which, and where criteria are not ideal. That being said, there are many movement correction algorithms that handle these issues for us. 2D arrays are very similar to 3D arrays in the sense that they are used to measure local field potentials. The main difference is that they only sit on top of the brain. 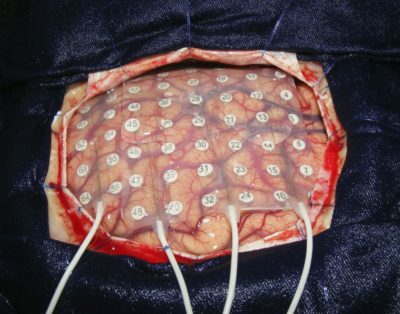 ECoG, or electrocortcography, is the most popular 2D array. I warn you that this next image is a little graphic, so scroll past it quickly if you aren't good with brains, but below you can see an image of what a 2D array looks like on a real human brain. The drawback with 2D arrays is that you don't get depth, but as long as the process you care about investigating targets the top of cortex it should be satisfactory. In addition, the when, which, and where metrics are equivalent to those used with 3D arrays, so we won't review them again. Non-invasive ways to measure brain function can either be electrical or blood based. In these cases you lose a lot of precision with your measurement. We are talking about getting bulk signals from tens of thousands if not hundreds of thousands of neurons. You can forget about knowing what an individual neuron does, but depending on your experimental question the resolution of the data can be sufficient. Let's start by describing how an EEG works. 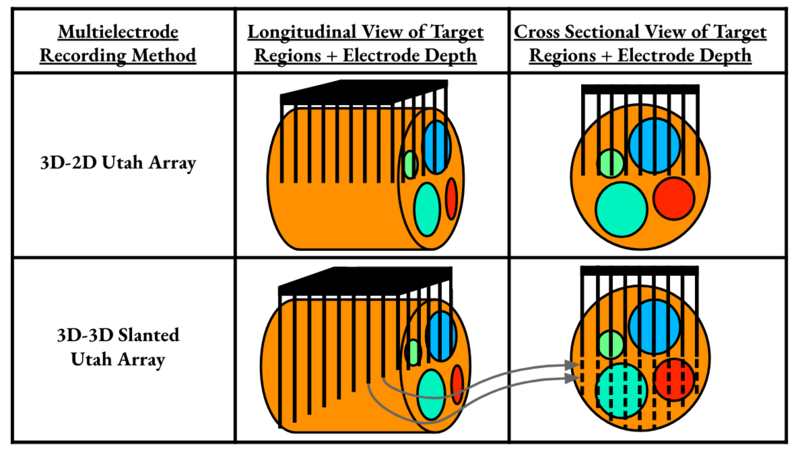 An EEG is essentially a non-invasive set of electrodes that records local field potentials, making it in principle similar to the 3D and 2D arrays we discussed above. Because an EEG must be placed on top of the scalp, it can only detect the action potentials from tens of thousands of neurons. EEGs are therefore useful for measuring large synchronized events across the brain like those encountered in epilepsy or sleep. 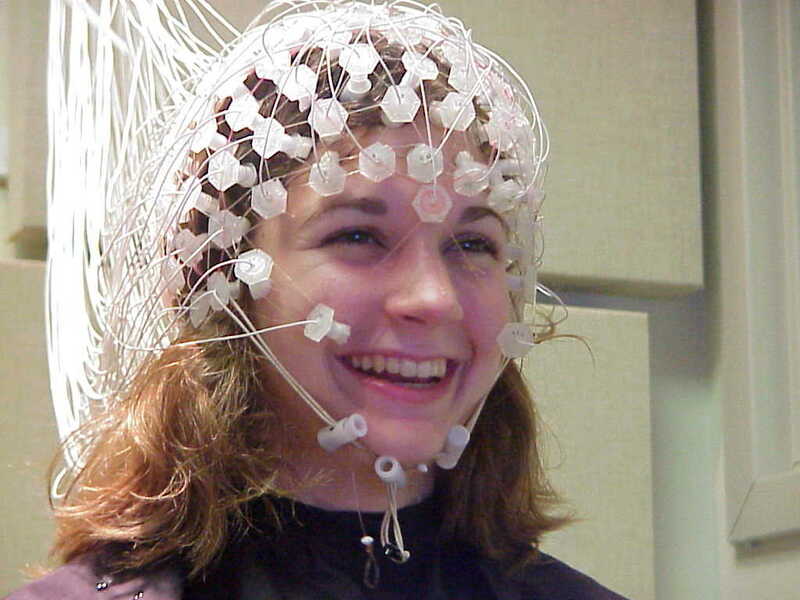 Now I have never seen someone so happy to be wearing an EEG cap, but check out the woman below who is clearly having a ball. One question that should be gnawing at us: how can we measure local field potentials noninvasively? Well it is largely due to the properties of the neurons underneath the scalp. Remember earlier how we saw that an action potential normally lasts on the order of a few milliseconds, well there are other signals in the brain that last longer. The postsynaptic potential is a graded response in the axon terminal. The postsynaptic potential occurs when neurotransmitters are released into the cleft, which is the space where one neuron ends and other begins. In cortical pyramidal neurons, the postsynaptic potential can last for tens of milliseconds, which is much longer than the length of an action potential. Since cortical pyramidal neurons are positioned perpendicularly to the scalp, when many have postsynaptic potentials at the same time relatively large electrical dipoles are created. An electric dipole is a pair of oppositely charged poles separated by some distance. When tens of thousands of neurons fire in synchrony, a very strong electric dipole builds up that can be measured from the scalp. I hate to say it, but EEGs are not great at any of the when, which, and where metrics we have defined. They can't tell you exactly when a single neuron fires, which, specific neuron has fired, or where in a neural circuit a neuron exists. Ok great, so why does this method exist? EEGs are useful because there are a lot of neural patterns that invoke tens of thousands of neurons at a time, like delta waves in sleep. For these high level functions EEGs are a fantastic experimental method. Before we explain what fMRI is capable of let's see what an MRI machine and fMRI scan look like. A common fMRI technique is BOLD fMRI, so we are going to dive into how it functions. 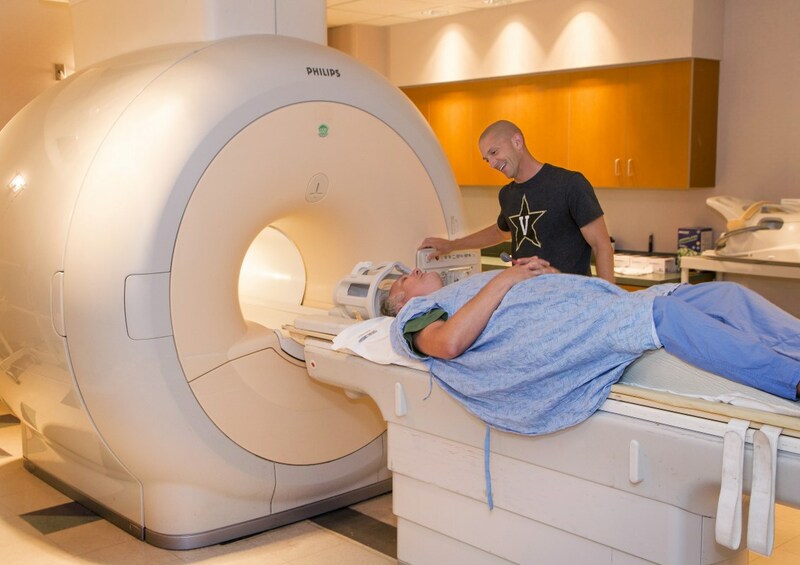 To start off, BOLD fMRI stands for blood oxygenation level dependent functional magnetic resonance imaging. Wow that was a lot, but let's go for it! The premise of BOLD is that neurons do not have an internal reserves of sugar and oxygen which means when they fire an action potential they use up energy that must be replenished. This process of using then needing sugar and oxygen is called the hemodynamic response. When hemoglobin comes and drops off oxygen molecules to the neurons the hemoglobin's magnetic properties change. The MRI machine can then detect the differences in magnetic properties between the oxygenated hemoglobin and deoxygenated hemoglobin. The images we generate from hemoglobin's different states look like the one below, where the orange areas are regions that were active. Ok this is cool, but the resolution is on the scale of hundreds of thousands of neurons. And if we learned anything from the EEG when, which, and where metrics, fMRI is not going to be much better. So, why is fMRI helpful? There are few neuroscience setups that allow you to experiment on awake human beings, and this happens to be one. In the fMRI your patient can be awake, and you can ask them questions or gives them cues to see which brain areas light up. fMRI gives you a high level understanding that can later be probed with the other functional data collection methods that we have discussed. We have covered a lot of ways to collect systems level, functional neural data from the brain. And now we should celebrate our knowledge by running an experiment! 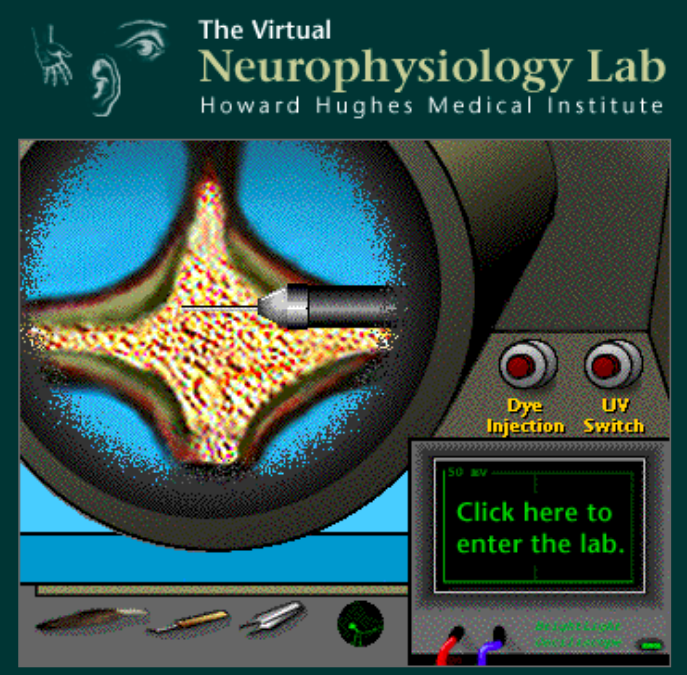 If you click on the image below, a virtual lab environment will appear. In this neuroscience lab you will be able to inject fluorescent dyes into leech neurons (a little different from what we discussed, but just pretend you are injecting a chemical indicator), and measure action potentials from leech neurons! Neurons are amazing, and the ways in which we attempt to measure their action potentials across systems will keep improving. For now though we've gotten a comprehensive understanding of how we gather these signals! In this article I referenced:  https://elifesciences.org/articles/25690,  https://www.ncbi.nlm.nih.gov/pmc/articles/PMC5715730/,  https://youtu.be/w6m5Pnox5z4,  http://www.jneurosci.org/content/36/39/9977,  http://www.sci.utah.edu/~gk/abstracts/bisti03/,  http://blackrockmicro.com/utah-slant-array/,  https://www.imec-int.com/en/articles/,  https://www.neurosurgery-blog.com/archives/11778/intraoperative-electrocorticography,  http://autism.wikia.com/wiki/EEG,  https://journals.sagepub.com/doi/abs/10.1177/155005940904000305,  https://www.livescience.com/39074-what-is-an-mri.html,  https://science.howstuffworks.com/fmri.htm,  https://www.youtube.com/watch?v=aUxteV8oFDI,  http://www.cns.nyu.edu/~david/courses/perception/lecturenotes/brain/brain-slides/?C=M;O=A,  Principles of Neurobiology,  https://www.vanderbilthealth.com/radiology/49783,  https://www.ndcn.ox.ac.uk/divisions/fmrib/what-is-fmri/how-is-fmri-used. If you like my content let me know, by tweeting or subscribing below!